Spend the night at Pentecost in beautiful Friesland! On a beautiful day of Pentecost … you are at the right address at Familiecamping De Kleine Wielen! A long weekend full of holiday fun, good food and of course conviviality. Also the temperature starts to rise again, because the summer is coming, which makes it more pleasant to be outside. At the campsite you can go swimming, canoeing, cycling or playing in the playground. Near? There you will find nice trips such as AquaZoo, Monkey Town, the Fries Scheepvaart Museum or an active day at Midgetgolfclub Leeuwarden. Take the bike for a visit to the city of Leeuwarden itself or take a relaxing walk through the nature reserve of “De Groene Ster”. 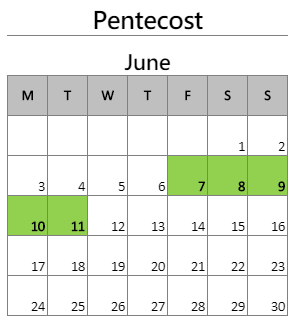 One thing is certain: you will have a wonderful weekend at Pentecost. Book your spot directly online! You book the Pinkster offer from € 90,- for 2 persons. For this you may stay at the campsite during the period from June 18 to June 22, 2019. Taking extra people or a pet? The online booking system calculates the new price for you. Tourist tax € 1,- p.p.p.n.